Black Pearls are produced by the black-lipped pearl oyster (Pinctada Margaritifera). 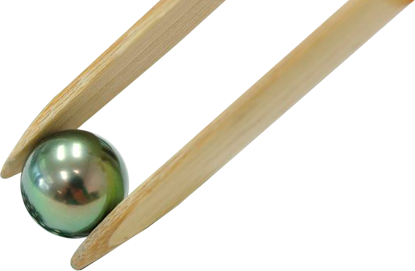 Tahitian pearl sizes normally range from 8.0 mm to 14.0 mm. The oyster that produces south sea pearls is the Pinctada Maxima, known as the golden lipped and silver lipped oysters. South Sea pearl sizes usually range from size 7.5mm to 20.0mm, with the average size being 12.0 mm. A Flawless pearl. Surface is free from any blemish visible to the naked eye. May have one or two slight blemishes which can be hidden by the drill hole or pearl setting. bright, diffused lighting is mirror-like and well defined. Lesser degree of surface reflectivity and shine than 'Excellent' but producing a very clear reflexion. The reflexion of a nearby object in bright, diffused lighting is well defined and clear. As a general rule, the spherical or Round pearl are the most valued. Spherical shapes include Round and semi-round, wher there is a small variation in the vertical and horizontal diameter. of blue and silver through to deep green and aubergine. All our pearls are undrilled.